The software is designed to prepare the user for certification in Production and Inventory Management. For information regarding pre-requisites for certification, schedules, fees, etc. contact APICS. SMR-Step V10.0 was authored by David Carpenter, CPIM, CSCP; a consultant with over 25 years management experience, having held positions in consulting, materials management, supply chain and finance. Mr. Carpenter has a Bachelor of Science degree in Accounting from American International College and did graduate work at Western New England College. He is certified in Production and Inventory Management and as a Supply Chain Professional. He has taught graduate level courses in production and inventory management, as well as certification courses for APICS. Mr. Carpenter has been a speaker at local, regional, and international APICS conferences. He has held several positions at APICS chapter offices and has served as past president of the Western Massachusetts chapter. Individual Licenses can be purchased for various lengths of time, for example 30, 60, 90, etc. days. These are your License Days. The Subscription Time is the time frame in which you can start the License Days you purchased. Once you activate the program the License Days start and run consecutively. Access to your program will stop when you use all of your License Days or the Subscription Time ends (regardless if you used your License Days). For online programs you can purchase additional License Days during your Subscription Time by contacting DataChem Software. Multi User Licenses will time out, regardless if all the purchased seats were used, in one year plus the number of License Days you purchased. This is called your Subscription Time. You may assign seats/users any time during your Subscription Time. Once the end user activates their program their License Days start and run consecutively. Multi User Online License: During your Subscription Time the Account Manager for your organization’s Multi User License can observe usage by assigned users. They can also purchase additional seats during the Subscription Time by contacting DataChem Software. Special Licenses: For any other special licensing needs contact DataChem at 1-800-377-9717 or at datachem@datachemsoftware.com for additional information. Complete and detailed explanations are provided for each question so you know exactly why something is correct or incorrect. Select questions containing key words or search all subjects for a specific topic/question. Mark questions for special review at a later time. Take practice exams anytime, anywhere...at work, at home or on the road. The more you practice, the better chance you'll have to pass your exam! Simulate taking the actual exam. 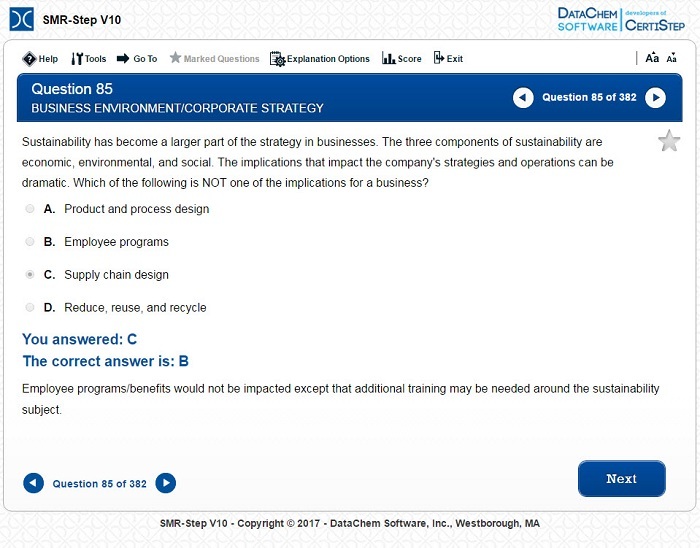 Get in the habit of answering multiple choice questions quickly and effectively. Identify your strong and weak subject areas so you can concentrate on improving your score. Online Programs will work on internet connected devices (computers, tablets, smartphones, etc.) running any of the following browsers: Chrome, Firefox, Safari, Internet Explorer, Opera, and Edge. Downloadable and CD Programs will work on devices running Windows Vista, 7, 8, 8.1 or 10. You need 150 MB to download a program and 20 MB of permanent disk space after installation. Internet access is initially needed to register the program. The program will only install on one computer.